= Now that really creeps me out. Hi everyone! 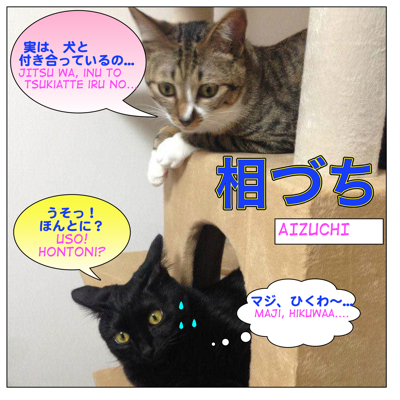 Today we have two lovely cat teachers, ミトンズ ( = Mitonzu) and フ ( = Fu). They are having a secret 恋バナ ( = koibana), a love story, a romantic story. ミトンズとフです。= Mitonzu to Fu desu. = We are Mittens and Fu. The linguistic translation of 相槌 / 相づち ( = aizuchi ) is “back-channel feedback”. In other words, it’s conversation gap filler — short and quick responses made while listening to someone to show your interest or willingness to hear their story or to encourage the speaker to keep talking. Examples of this in English would be: “Right.”, “Uh-huh”, “Oh really?”, “I see.”, etc. = to give back-channel feedback. We realized during our meeting with Maggie Sensei and Yukari that they nodded and used interjections much more than we usually do. They said if we don’t do the same, they’ll feel uncomfortable because they won’t be able to tell if we are listening to them attentively or not. So today we’ll learn a lot of different kinds of useful interjections. They’ll help you sound more natural and help the conversation along. = Yes. / I see. / Uh-huh. / OK.
= Yeah. / Uh-huh. / I see. / Mm hm. Note: はい ( = hai) ，ええ ( = ee) and うん ( = un) are usually used as “Yes” to answer someone’s question. But in this case, you just say these to show the speaker that you are listening to them. If you have a chance to listen to Japanese conversations, you will hear a lot of はい ( = hai) ，ええ ( = ee) and うん ( = un) accompanied with nodding. We will show you how to make gap fillers. = Minna ni shirasete kuremasu ka? = Could you tell everybody (about this)? = OK, I will take care of it. OK, here are some more gap fillers. Some of them are very colloquial. You may not see them in your textbooks. These are not just for verbal usage. You can use them when you write comments on Facebook, Twitter, Instagram, etc. = Jinsei wa tanoshimu tame ni arunda yone. = You have to enjoy your life, you know. = That’s right. / You should. / I agree. = Nihon no onsen, saikou! = Japanese hot springs are the best! = That’s right. / I agree. = That’s right! / I agree! =Anna kare no koto wa wasurete motto ii hito wo mitsukeru! = I will forget about that guy and find someone better. = That’s right! / I agree! / There you go! = Maggie Sensei wa itsumo shukudai wo ippai dasukedo chekku shinai kara shukudai wo yatte mo muda dayone. = Maggie Sensei always gives us homework but she never checks it. I think doing homework is a waste of time. = That’s right! / Exactly! / Right! / Tell me about it! = Shuumatsu, yasumi ga nai nowa kitsuina. = It’s tough not being able to take day off on the weekend. = That’s right! / Exactly! = Yappari koko no raamen wa oishii naa. = As I expected, the ramen here is the best. = Isn’t it?!? / I told you it’s good! = Miton “Watashitachi wa ningen yori mo nihongo jouzu damon ne. ★When you understand the speaker’s point or emphasize their feelings. = I know exactly how you feel. / I understand very much. = Kare no koto wo omouto gohan mo nodo ni tooranainda. = I know (how you feel)! ★When you encourage a speaker to talk more. = Kinou, saifu wo ie ni wasurete kichatte saa. = Sorede doushitan desu ka? = And what happened? / And what did you do? = And then what happened? = Kore ga watashi no kaita e desu. = This is the picture I draw. = “Kore, Maggie kara morattano. = I got this from Maggie. Note: へ〜 (=hee) changes the nuance depending on the intonation. When you say it enthusiastically, you show your interests and if you say it in a lower tone, you show your indifference. ふ〜ん (=fuun) is usually use when you are not that interested. = Kare, Osaka ni hikkoshitarashiiyo. = I heard he moved to Osaka. ★When you just found out something or the the reason something happened, etc. = Dengen ga haitte inai kara ugokanakatta nodesu. = It didn’t work because the power was off. = Iroiro atte kaisha wo yameru koto ni shimashita. = Oh really./ Oh I see. = Kare ga keisatu ni tsukamatta rashii yo. = I heard he was arrested by police. = No way! / It’s impossible! = I can’t believe it. = No kidding! / Get out of here! = Really? / Seriously? / No way! Note: You can write REALLY both ways: 本当 (ほんとう / hontou) & ほんと (honto). = Nobita ga Shizuka chan to tsukiatte iru rashii yo. = I heard Nobita is seeing Shizuka. = Seriously? / No kidding! / No way! = No way! / It can’t be! = Kono tokei, gojuuman-en mo shitanda. = This watch cost me 500,000 yen. = Nattou ni satou wo irete tabete mitayo. = I tried Natto with sugar. = Konnsaato no ken, amatta kara ageru! = I got an extra concert ticket so I will give one to you. = Yay! / Yippee!/ Yes! = Toudai ni ukatta yo! = I passed Tokyo University! = That’s great! / Good for you! = Great!! / Wow! That’s great! / Awesome! = Woow! / Greaaat! / Awesome! = Wow! / That’s great! / Awesome! = Ahita kara nyuuyooku ni ikunda. =I’m going to N.Y. from tomorrow. = Wow, that’s great! / Good for you! / I’m jealous! = Sore wa tanoshimi desune. = That is very exciting! = Sore wa tanoshimi dane. = Sore wa tanoshimi dana. = Jitsu wa, kotoshi kekkon suru koto ni narimashita. = Actually, I am going to get married this year. = I am very happy for you. = Good for you! / I’m happy for you! = Jitsu wa, saikin, kubi ni narimashita. = Actually, I got fired recently. = Aruzenchin ni ikundakedo sanjuujikan mo kakarun datte. = I am going to Argentina, but it’s going to take 30 hours. = Sore wa kitsui desune. = That’s tough, isn’t it? = Sore wa kitsui na. = Kono mondai ni tsuite dou omoimasu ka? = What do you think about this problem? Note: やだ( = yada) is also used to show surprise. = Josei wa yappari ie ni ite uchi no koto wo yatte hoshiin dayone. = After all I want women should stay home and do housework. = I wonder if you are right. = Mou kare to wakareta hou ga ii no kanaa. = Do you think I should break up with him now? Note: This might be very confusing but if you say そうですね ( = Soudesune) , it means “Yes, you are right. You should break up with him.” and you give your opinion. But if you stretch the last letter, ね～(=nee) (or ねええ=nee) , the listener can tell you are not sure. Fu = Uso! Honto ni? Fu = No way! Really? Note : マジひくわ。= Maji hiku wa. or マジでひくわ。= Maji de hiku wa. is a very colloquial expression when you see / hear something too weird or creepy. Mitonzu: Kore de watashitachi no ressun wo owarimasu. Mata mina to kokode aetara iina. Mittens: Now we’ll wrap up this lesson. We hope to see you here again. Fu: I hope so, too! = Kikijouzu no hito wa moterun datte. = I heard good listeners are very popular with girls and boys. = Minna mo kono ressun de benkyou shite kikijouzu ni nattene. = Hope you become a good listener by studying this lesson. 1- the different usage of kakeru/kakaru ? by now I know the most common ones but lately I came across a korean movie named in Japanese (海にかかる霧）. I know the overall meaning is like the see overwhelmed by fog something like that,.. but I don’t know the exact meaning in Japanese. 4- I want to know the difference among : manabu/ benkyou suru/ narau/ osowaru? 2. 3. 4 つい: OK, will add them in the list. I can’t promise that I will make all the lessons but will try to make some for you in future. bty, there is something I want to ask you privately.. and don’t know how I should ask tell.. do you an email? Well, I can’t give you my personal email here… If I do, some people may start to use it to ask me Japanese questions or ask me to translate something. You don’t need to give me all the details here but can you just tell me what it is about? I always read people’s comments before I release them. So if it is something personal, just add “Confidential”. I will not post it. So don’t worry. And if I think I can help you, I will email you using your email address that you left when you left a comment. I am sure I have use the word “kekkou” a lot in the example sentences but I don’t have a particular lesson on the word. What part is difficult for you? I can help you here. thanks sensei,,, i dont know how to use in sentence,,, and i dont know what is the really meaning of kekkou,,, thanks again and God bls sensei….. I really hope you are doing fine. Thank you always for posting beneficial lessons. Please continue to do that.You’re the best teacher ever. Do you have any new pets? I don’t understand “余った” what is the meaning of this verb and its plain form? Please explain “から” its meaning here is “if”? I don’t understand. 2. “東大に受かったよ。” He means he passed the entrance exam? Also, how to say “I failed the entrance exam for 東大? 3. ” ミトンズ「彼、フのこと好きなんじゃない？」” What is “なん” here and what is its function in grammar? 4. About “ええ” which means “yes” is it formal? more than “はい”？Who uses it females or males? ＢＴＷ、How to say I’m looking forward to hearing from you? I have extra concert ticket(s) so I will give it to you. So the speaker has extra concert ticket(s) so he/she wants to give it to the listener. から here is to give a reason = because, since, so. 4. はい is more polite than ええ, but ええ is polite enough when you show you are listening. 5. Ahh good question! Maybe romaji is aizuchi and not aiduchi, it might be confusing. The origin of the word, 相槌=(aizuchi), is more than two people pound molten metal taking a turn. 相(あい） means “together/ each other”+ 槌(=つち）means hammer. There are exceptions but you always have to pay attention to how you read the individual kanji.